Now you can bring your virtual dalliances into the real world! As much fun as virtual reality can be, watching someone enjoying themselves in an immersive world can be a bit boring for those watching from the outside. 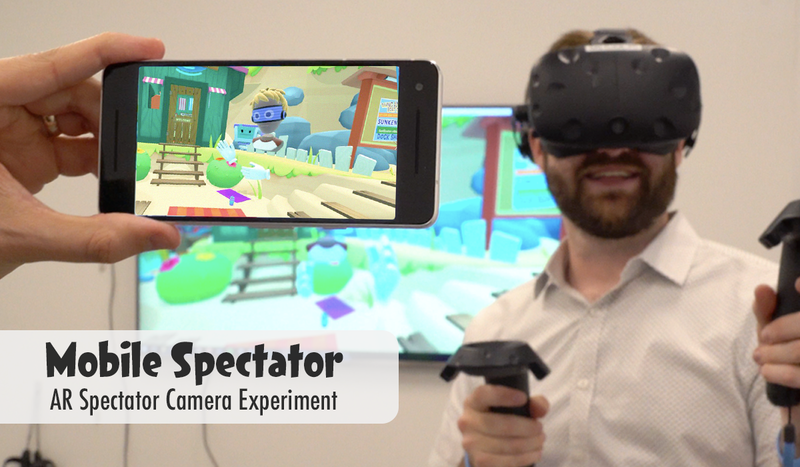 But it doesn't have to be – not with Owlchemy Labs' latest creation: a new project called Mobile Spectator. Taking to the official Owlchemy Labs blog, the Job Simulator developer showed off a very cool new AR app that will allow people to spectate and take a look at exactly what's going on in the virtual space using a smartphone. All you need to do is connect to wi-fi, calibrate your headset, and then "spectate" what your friend is up to in their VR title! The Mobile Spectator mobile app uses ARCore tech to help track your phone's position in the real world, so that's why you need to calibrate it in VR. You'll do this by pointing your camera at the VR headset and syncing it, which allows for a connection between both devices. The process is outlined in the Owlchemy Labs blog, but all you really need to know is that it doesn't require any special networking code, doesn't need the application to run natively on the phone, and you can get tons of cool high-quality video capture. It's pretty heavy on resources, however, and it might not work on all platforms – those are the only drawbacks from this process, according to Owlchemy. Mobile Spectator does require you to use an in-game avatar, as Owlchemy notes, but there's a whole bushel of things you can do with it. You can even interact with the VR player who's in-game, such as by throwing a bunch of beach balls at the player. This isn't the only thing Owlchemy has in store, either, as the tech is consistently being researched and worked on further. Check out the original post for more about the tech and we'll keep you updated on what it ends up being able to accomplish as more information comes out!